April is in full swing and with it has come Distracted Driving Awareness Month. Being observed throughout the United States, the month serves to raise general awareness and point the attention of lawmakers and automakers towards safer regulations to make the roads safer. Aside from the numerous events going on throughout the country, heavy debate has been sparked on the automakers side, as in car technology has now become a large topic of discussion. Talks in Washington D.C. have involved major discussion over the impact that built in gps and stereo systems are having on the attention span of drivers these days. Lawmakers are calling for the vehicle manufacturers to tone down their entertainment. GPS modules and entertainment/stereo systems are certainly continuing to grow, becoming more complex along with the times. Just as many are pointing towards automakers to help minimize risk in these times, they car companies are looking for accountability from technology developers. Certainly smart phone developers and portable GPS makers share some responsibility for the impact their products have had, but options are somewhat limited from a lawmaking standpoint. Automakers are seemingly determined to work out efforts, however. It was reported that they are attempting to work with cell phone developers in an effort to fight cases of distracted driving. The National Transportation Safety Board has called to have more integration with cell phones into the cars, allowing for more hands free use, and eventually a positive impact on the road. It will take some response from the cell phone developers, however. Right now, these companies have done little to come to the table and discuss possible options. Hopefully the increasing cases of distracted driving will highlight the need for these developers to work on a plan to help minimize future road problems. 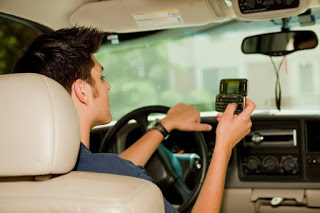 Laws relating to distracted driving are heavily different throughout the United States. Around 35 states currently have a full ban on text messaging, while nine have a full ban on the use of hand held cell phone devices. Just recently, the city of Chapel Hill, NC made news by becoming the first town to enact a ban on cell phone use while driving. The impact of the recent Chapel Hill law, going along with Distracted Driving Awareness Month taking place this month will be far reaching from adults to teenagers. There are a number of states where stricter laws may be necessary to minimize distracted driving cases in the future, while attention will certainly come upon automakers and technology developers as well. All in all, the awareness month in 2012 serves to increase attention to one of the great dangers today and will continue to do so in coming years.